French president Emmanuel Macron’s European election campaign is being suspended until further notice after a fire destroyed parts of Notre Dame cathedral, according to French politician Nathalie Loiseau who is leading the campaign. For more than 12 hours, more than 400 firemen worked to control the immense fire that consumed the roof and collapsed the spire of the eight-centuries old cathedral on Monday night. "We are all going through a moment of extreme sadness. The 'Renaissance' list is understandably part of this moment of national unity. We are therefore suspending the campaign until further notice," Loiseau said on Twitter. Marine Le Pen's Rassemblement National also said they would halt their campaign. Jordan Bardella, the head of the campaign tweeted: "It's part of our History that burned and like all French our heart bleeds." "Notre Dame is one of the most beautiful creations of humanity and this tragedy merits that politics stops for just a moment," he said on Twitter. "We are obviously suspending our campaign." Another party that suspended their campaign was the right-wing Debout la France, which is a member of the Eurosceptic EU Democratic Party. 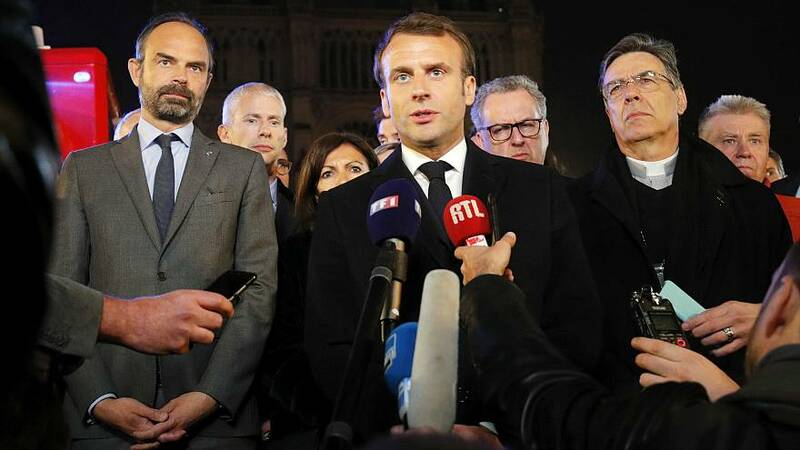 It's president Nicolas Dupont-Aignan said that "in face of such calamity that all the French people will feel as national mourning, the time of division is over." "We suspend our European election campaign and call for sacred union to transcend this new ordeal facing our nation," he said in a statement. A statement by the Elysee Palace said that Macron's speech on the results of the Great National Debate will be postponed until further notice.